Grundschober, I., Ghoneim, A., Baumgartner, P., Gruber-Mücke, T.
The ATS2020 learning model requires significant changes of traditional teaching as it means moving from a teacher- to a learner-centred way of education. Digital tools are central within the ATS2020 learning approach. Not all teachers have expertise in using digital tools in class and in knowing how to use them in order to support transversal skills. A pattern language for feedback and assessment supports teachers in applying the ATS2020 learning model, as it builds on good practice experiences in the past. Many teacher-centred patterns cannot be used anymore, new patterns are necessary. 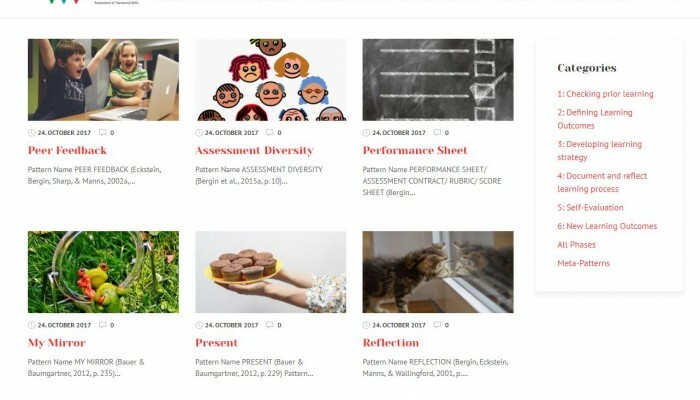 In the pattern community pedagogues all over the world have minded patterns for formative assessment and we want to make use of these already existing patterns to help teachers establish an learning environment which supports formative assessment and feedback, like promoted in the ATS2020 learning model. We created a pattern collection for formative assessment, which includes 36 patterns from 11 pattern languages.